You guys know that we love a good pair of sneakers. We live in ‘em! And if there's one season that feels especially sneaker-worthy to us, it's Fall. There are so many Fall activities that are just better served with a pair of cool, comfy sneakers and because you guys were so into our The Best His & Hers Summer Sneakers Under $100 post, we thought we'd do the same thing for the season we all love so much and round up our favorite his & hers awesome (and awesomely affordable) sneakers for fall, too. Because we’re just here to to give you more of what you love! This time they’re all under $150 instead of $100 because there are some really good options in the $100 to $150 range that we didn’t want to leave out. But there are plenty amazing choices under $100, too! In our personal opinion the Fall sneaker options for both men and women are even better than the Summer offerings, so there's a lot to love in today's roundup. Rich colors and cozy materials like suede, flannel and wool. New school platforms and old school high tops. Minimal classics and funky prints. We included all that and more in the Shop widgets above and below, and we have to say that we're really loving the wide variety of sneaker styles out there right now, which isn't always the case for us when it comes to footwear trends. The one exception to that? The chunky 90s dad sneaker trend that seems to be taking the high fashion world by storm. I'm not here for it, guys. I'm NOT HERE FOR IT! I cannot and I will not get on board that trend. One of the things I love most about the sneaker styles that have hit the scene in the last couple of years is that so many of them are slightly more polished and of the leather and suede variety, so they aren’t solely relegated to pairing with super casual, dressed downed outfits like they once were. 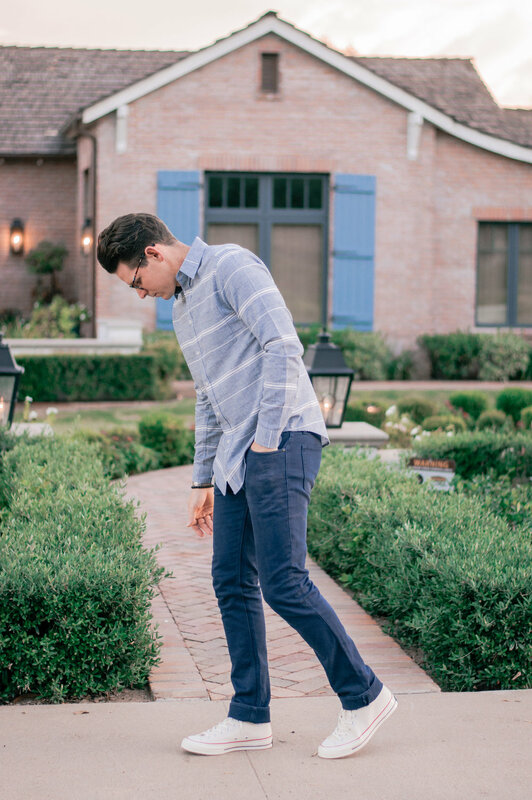 Now you can pair a slightly more polished ensemble with a nice pair of sneakers, look put together and even possibly office ready, and still be comfortable and be ready for any activity on your feet. Which I think is such an awesome shift in footwear trends. It certainly saves our feet from always having to endure the stiff, blister-enducing flats and oxfords or yore! As you can see, we’re both really loving the Fall offerings from Converse this year. 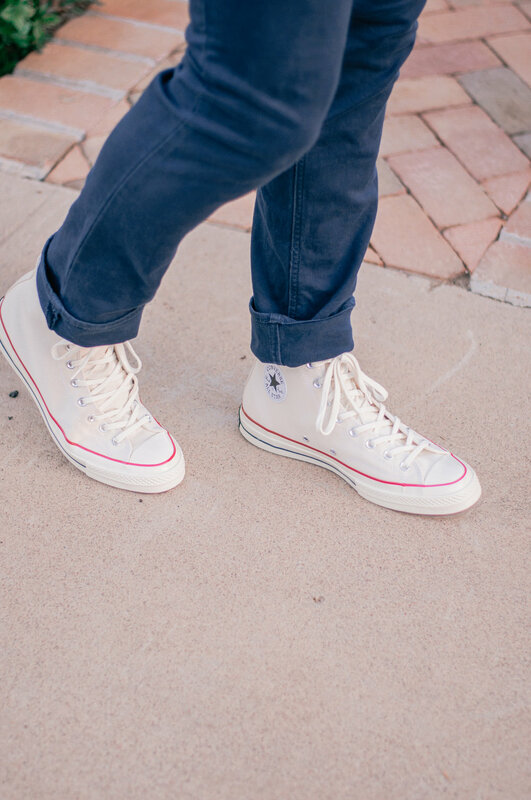 We’ve never necessarily been opposed to Converse and have both worn Converse on and off throughout our lives (they’re a classic! ), but we were just saying the other day that we kind of fell out of love with the fit and comfort of Converse for a while there. We both felt like they weren’t that flattering on our feet (a little bit floppy, no?) and weren’t really that comfortable if we had to be on our feet all day or walking around a lot. But we’re really excited about what seems like a shift in the Converse universe and the new styles and fits they’ve been releasing in the last year. They’re so good. I opted for one of their new platform styles, the Chuck Taylor® All Star® Platform because I’ve really jumped on board the platform train since I bought my beloved Keds Triple Kick Platforms this summer. I’ve been so surprised by how much I’ve loved the little lift a platform sneaker gives me and honestly, I think the extra cushion is kind of a game changer on the comfort front and not at all ankle-breaking like I thought it might be. Who knew?! 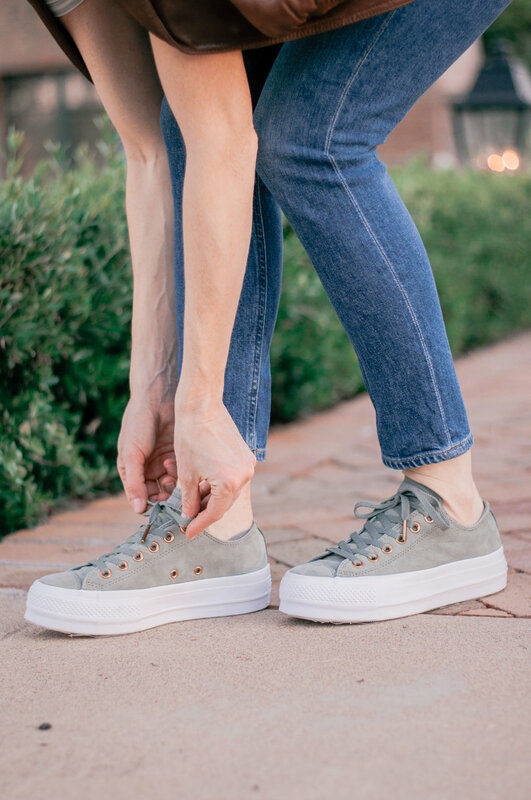 This particular suede style comes in this beautiful sage green that I have on here, but it also comes in the most gorgeous, fall-perfect burgundy that I’m seriously considering grabbing. 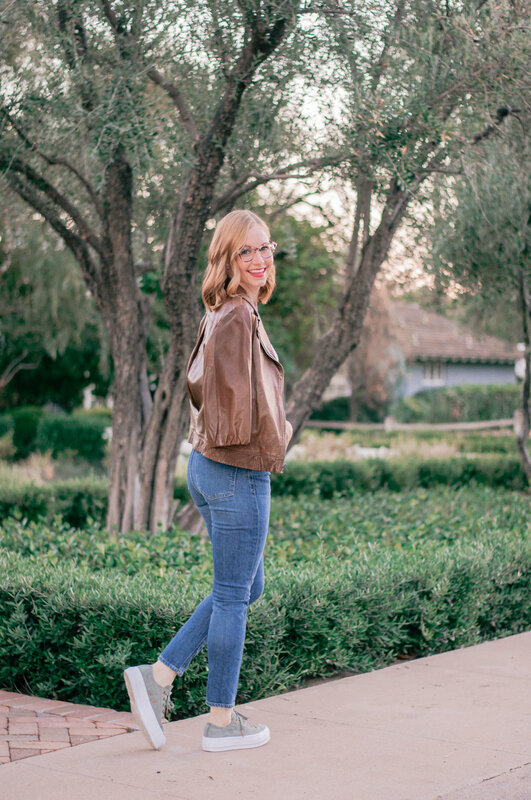 I love the sage color because it pairs well with basically any outfit, but I always think that a burgundy shoe can be so versatile for fall. If you, like me, are curious about the whole platform sneaker trend and contemplating buying a pair and trying it out for the first time, the brands that I think have the most attractive, wearable platform sneakers that don’t look absolutely ridiculous are Converse, Keds and Superga. I obviously love the Converse platform sneakers that I have on as well as the Keds platform sneakers that I mentioned above, but these platform Superga sneakers are super cute, too and not at all overwhelming, in my opinion. I’m also really loving these blush suede Seavees platform slip-ons, too! 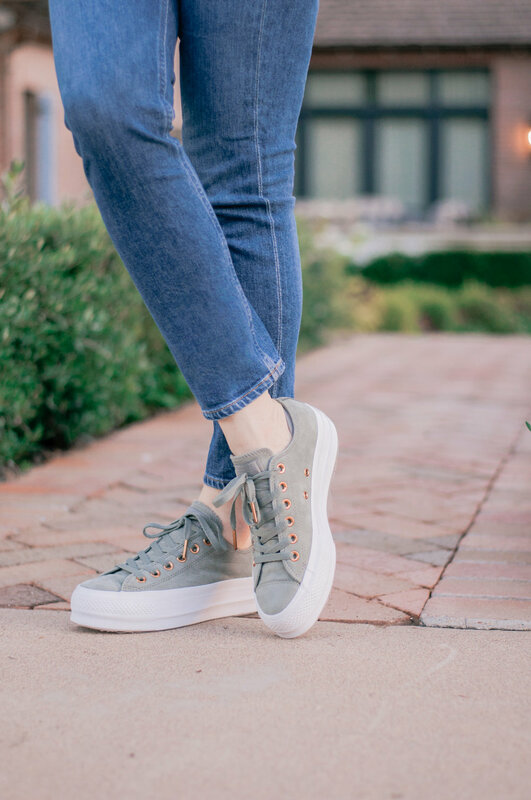 Outside of platforms, I’m also loving these adorable blush corduroy Seavees Legend Cordies sneakers, these pretty little velvet Tretorn Marley sneakers, and these beautiful blush suede perforated Seavees Monterey sneakers. When Chris was looking for the perfect fall sneaks, he was even more hesitant than I was to look at Converse’s options, but he saw this pair, the Converse Chuck Taylor® All Star® 70 High Top at Nordstrom and the super stylish guy helping him actually encouraged him to go a half size down from his normal size for a better, less clown-like (but still comfortable) fit and he was so happy that he’s fallen in love with Converse once again. 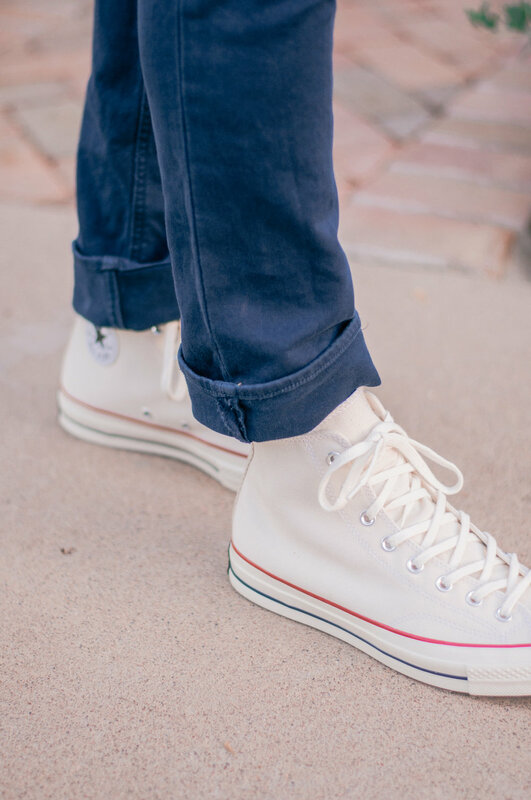 He also loved the retro vibe of this particular style and the fact that they weren’t the regular old Converse white, but this cool natural canvas fabric/color instead. They go with just about anything and everything in his closet and until they get completely demolished, he can totally rock them to work on his more casual days. BTW, they also have an identical low top version, too if high tops aren’t your thing! Chris is also loving these super cozy grey wool Sperry Captain’s CVO sneakers, these Converse CT 70 sneakers in the most gorgeous, rich caramel nubuck, these suede and leather Sperry Gold Cup Havens (in so many cool Fall colors) and these suede Seavees Racquet Club sneakers. In general, I think we both agree that if you’re buying a Converse sneaker style, you should at least try a half size down and see if that has a better fit than your regular size to save yourself from running into the clunky, floppy problem. If you’re ordering online, my advice would be to order both your normal size and a half size down just to compare and send one back. Normally, I wouldn’t say that sneakers with more room in them are as uncomfortable as sneakers that are too small, but in the case of converse I think it’s that they’re a heavier shoe so the extra weight can be uncomfortable for your arches when you’re lugging them around on your feet all day. Don’t forget that if you’re looking for great fall sneaker options, we rounded up tons of our favorites from all around the interwebs that we didn’t talk about in the shop widgets above and below, so make sure you click the arrows to scroll all of the awesome styles to find a pair you can love all season long… and beyond! 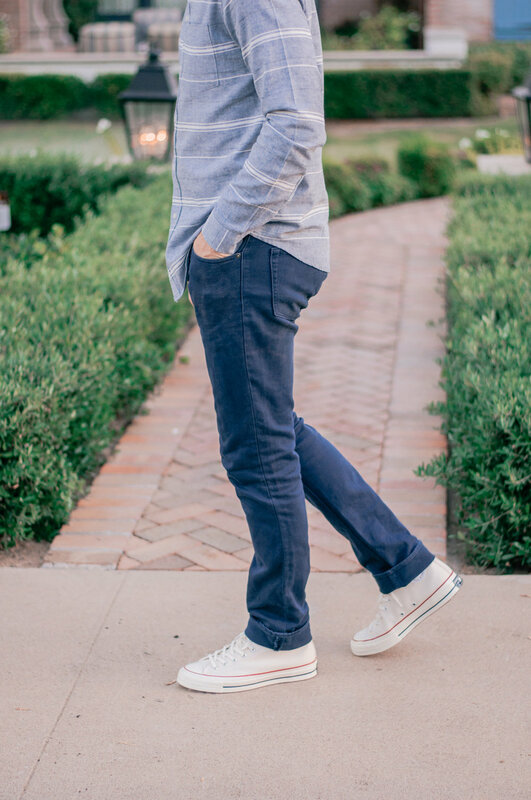 and as you can tell, the whole dressy-casual sneaker thing is a subject we’re pretty passionate about because comfortable footwear is the jam, so make sure you give us a shout in the comments section if you’re looking for more recommendations, fit or style advice. We’ll talk cool sneaks all day long!